The knowledge of death came to me that night, from the dying that engulfs the world. I saw how we live toward death, how the swaying golden wheat sinks together under the scythe of the reaper, / like a smooth wave on the sea-beach. He who abides in common life becomes aware of death with fear. Thus the fear of death drives him toward singleness. He does not live there, but he becomes aware of life and is happy; since in singleness he is one who becomes, and has overcome death. He overcomes death through overcoming common life. He does not live his individual being, since he is not what he is, but what he becomes. One who becomes grows aware of life, whereas one who simply exists never will, since he is in the midst of life. He needs the heights and singleness to become aware of life. But in life he becomes aware of death. And it is good that you become aware of collective death, since then you know why your singleness and your heights are good. Your heights are like the moon that luminously wanders alone and through the night looks eternally clear. Sometimes it covers itself and then you are totally in the darkness of the earth, but time and again it fills itself out with light. The death of the earth is foreign to it. Motionless and clear, it sees the life of the earth from afar, without enveloping haze and streaming oceans. Its unchanging form has been solid from eternity. It is the solitary clear light of the night, the individual being, and the near fragment of eternity. The moon is dead. Your soul went to the moon, to the preserver of souls. Thus the soul moved toward death. I went into the inner death and saw that outer dying is better than inner death. And I decided to die outside and to live within. For that reason I turned away and sought the place of the inner life. ~Carl Jung; Red Book; Page 267. Thomas Lyttle, Ed., Introduction by Timothy Leary, Autonomedia, NY, 1999. ABSTRACT: There is a generic process in nature and consciousness which dissolves and regenerates all forms. The essence of this transformative, morphological process is chaotic--purposeful yet inherently unpredictable holistic repatterning. The Great Work of the art of alchemy is the creation of the Philosopher's Stone, a symbol of wholeness and integration. The liquid form of the Stone, called the Universal Solvent, dissolves all old forms like a rushing stream, and is the self-organizing matrix for the rebirth of new forms. It is thus a metaphor or model for the dynamic process of transformation, ego death and re-creation. The alchemical operation SOLUTIO, called "the root of alchemy," corresponds with the element water. It implies a flowing state of consciousness, "liquification" of consciousness, a return to the womb for rebirth, a baptism or healing immersion in the vast ocean of deep consciousness. It facilitates feedback via creative regression: de-structuring, or destratification by immersion in the flow of psychic imagery through identification with more and more primal forms or patterns--a psychedelic, expanded state. Chaos Theory provides a metaphorical language for describing the flowing dynamics of the chaotic process of psychological transformation. "All substances are part of my own consciousness. This consciousness is vacuous, unborn, and unceasing." Thus meditating, allow the mind to rest in the uncreated state. unmodified condition, clear and vibrant. Alchemy had one great prescription for the accomplishment of the Great Work: "Solve et Coagula"--reduce or dissolve all to its primary, most fundamental essence and embody that creative, holistic spirit. The ancient alchemists sought to transform "lead" into "gold." We repeat this process as modern alchemists when we seek the transformative medium which allows us to recognize our rigidities ("lead") and facilitates our healing and expression of our full creative potential ("gold"). That medium is the ever-flowing river of our consciousness. The organic, regenerative process of "re-creational ego death" is common to mysticism, experiential psychology, and psychedelic journeys. Spiritual exploration, or soul travel, is shared by all three modes of immersion in the universal stream of consciousness. They are all variations on the theme of the consciousness journey, and echo our shamanic roots, and the mythemes of eternal return and hero/heroine. Participants reach a deep, integral level, and direct experience of Higher Power, often merging with the Creation or the Creator. All these modes facilitate psychedelic consciousness, though any given experience may vary in duration and depth. Their prescribed frequency varies: meditators are advised to "die daily;" in psychotherapy once a month may be enough for regenerative therapy; psychedelic use varies from single experiences, to monthly, to annually. Despite different modes of induction, all these experiences reflect the illusory nature of time, space, and ego as reality constructs. The primary nature of consciousness is revealed. The word psychedelic has its roots in the Greek psyche, soul, and delos, visible, evident. It is direct evidence of the soul, the pure manifestation of soul. Stace (1960) identifies nine qualities of the psychedelic experience as follows: 1) unity of all things; 2) transformation of space and time; 3) deeply felt positive mood; 4) sacredness; 5) objectivity and reality; 6) paradoxicality; 7) alleged ineffability; 8) transiency, and 9) persisting positive changes in subsequent behavior. In the practice of mysticism there is identification with progressively more subtle "bodies" or vehicles of consciousness, culminating in a transform from a mental or causal body to a vehicle of pure Light. In experiential psychotherapy, transformation results from deepening within the flow of psychic imagery, progressively identifying with more primal forms, and ultimately with formlessness. In psychedelic experience, expansion of consciousness dissolves ego boundaries leading to morphological transformations and ecstatic communion. In alchemy, one sought not only to find or create the Stone, but also to apply it, or use it creatively in the everyday world. Now, we might speak of integrating or actualizing the results of our transformations in daily life. Thus, self-actualization or self-realization implies the grounding of the spiritual fruits of inner exploration. The liquid form of the Philosopher's Stone was known as the UNIVERSAL SOLVENT. According to the alchemists, the operation of solutio (liquification) has a twofold effect: it causes old forms to disappear and new regenerate forms to emerge. To a rigid consciousness, the primal ocean of the unconscious is experienced as chaotic, violent, irrational processes of generation and destruction. Through "creative regression," the generic form of ego death, consciousness recycles, recursively bending back upon itself. The direction is a recapitulation of, a re-experiencing of sequences from earlier life, conception and birth experience, ancestral awareness, genetic and physiological recognitions, molecular and atomic perception, and quantum consciousness. As consciousness explores and expands, ego dissolves. Pure consciousness, the fundamental luminosity, is the ground state of unborn form. The generic purpose of ego death is to liberate our embodied being, precipitating communion with and re-patterning by the Whole. When all forms finally dissolve into unconditioned consciousness, the ground state of the Nature Mind is revealed as the mystic Void, the womb of creation. When the constructed forms which hold personality together are voluntarily relinquished, consciousness "liquifies" and rapidly moves toward the unconditioned state. Though easy to say, it is sometimes difficult to achieve such liberation from the mental-conceptual activity of the nervous system. When we do, the quiescent nervous system is open and receptive to the conscious recognition of pure energy transforms with no interpretations. The Universal Solvent dissolves problems, heals, allows life to flow in new, creative patterns. These new patterns embody the evolutionary dynamic. According to chaos theory, free-flowing energy is capable of self-organization. In consciousness this means that the obstructions to free flowing energy must first be dissolved. Through re-creational ego death, consciousness dissolves into healing communion with the whole of existence, renewing itself, emerging with a new creative potential. The need for the periodic destruction of outmoded systems implies the value of recycling consciousness through death/rebirth experience. The universal solvent is not ordinary water, but "philosophical" water, the water of life, aqua permanens, aqua mercurialis. It is also the panacea, "elixer vitae," "tincture," or universal medicine. To periodically dip into these healing waters has a tonic, rejuvenating effect which pervades all aspects of being, like a soothing balm. This divine water signifies the return of The Feminine, a reflective consciousness with inner awareness and archetypal spiritual perceptions. This Feminine Divinity is the Anima Mundi, or Soul of the World, the universal animating principle, the upwelling spring of the creative Imagination, the dynamic flow of imagery, pattern, and form. This dynamic has been known as Isis, Shakti, Maya, Shekinah, Sophia, Demeter/Persephone, Mary. In psychedelic mysticism, the animating principle is being referred to as Gaian Consciousness (Abraham, 1992), which we might view as a rebirth of ancient ecstatic, communal consciousness. It is the psychobiological basis of deep ecology, the flow of relationships. The return of chaos heralds the "greening of consciousness," the greening of the cultural wasteland. Hillman (1985) describes the anima not as a projection of, but rather the projector of psyche. We are contained within Her fantasy, not She within ours. Grinnell (1973) describes the transformative process of solutio which facilitates the fluid, mobile basis of consciousness: For aqua permanens is a mode of the arcane substance; its symbol is water or sea-water, an all-pervading essence of anima mundi, the innermost and secret numinosum in man and the universe, that part of God which formed the quintessence and real substance of Physis, at once the highest supercelestial waters of wisdom and the spirit of life pervading inorganic matter. The arcane descriptors of this paradoxical liquid Stone are cryptic, couched in metaphor. But what does it mean experientially and pragmatically? How does this chaotic transformative process engineer our consciousness? The divine water, as a liquid symbol of the Self, can be experienced in many ways. It has been described as innocuously as the "stream of consciousness," and as poetically as the "Heart of The River of Created Forms." Solutio implies the liquification of consciousness through the dissolution of rigidities which inhibit free flow. They include roles, game patterns, defense strategies, rigid attitudes and beliefs, interpretations, complexes, "old" myths, and "frozen" energy surrounding traumas which manifests as fear and pain. Fossilized or ossified energies create obstructions to free flow, like boulders in a stream produce turbulence. Destructuring transformative processes can dissolve them, increasing the sense of flow. This "liquified" consciousness is psychedelic, a nonordinary expanded awareness which dissolves fixations and habits, and loosens cramped attitudes. Mystic ecstasy, or the psychedelic state is mind-manifesting, consciousness expanding. It dissolves the identification of our consciousness with our histories, bodies, emotions, thoughts, and even beliefs. We are free to explore myriad forms, structures, and patterns, and/or become formless, resting in that unborn, unconditioned, unmodified healing state. We experience the essence of other forms of existence. The Oneness of all life and existence is directly experienced through a variety of transformations ranging from plant and animal identifications to planetary and universal consciousness. Entering the turbulent flow of the stream of consciousness, we can ride its currents back to the Source, pure unconditioned cosmic consciousness. We can imbibe the life-giving qualities of this "water" through mind-expanding experiential contact with this deep consciousness. The transformative process is also reflected in our modern physical worldview as chaos theory, which we can view as a modern "myth," a new metaphor for the dynamics of consciousness. Chaos is ubiquitous in nature, pervading all dynamic processes, perturbing them unpredictably. Chaos theory shows us that nature is continually unfolding new forms from the chaotic matrix of creation. Our dynamic consciousness is an essentially chaotic process. Chaos tracks a time evolution with sensitive dependence on initial conditions. When we "return" experientially to the "initial conditions" of our existence, our whole being is holistically repatterned. Our historical limitations are superceded by the creative power of the eternal Now. We can allow chaos, as the universal solvent, to liquify consciousness and re-create ourselves. This presumes a therapeutic atmosphere, a "safe" set and setting, because each phase of the journey is an encounter with uncertainty. The journey into deep consciousness appears inherently chaotic because the state of uncertainty pervades each moment of transition. Underlying moments of transience there are momentary blanks in awareness--little voids--flickering microstates which repattern each phase. Whether the experience is one of loss of personal boundaries or direct perception of stark, raw reality, or visionary dreams, there is no predicting where the chaotic orbit of consciousness will roam next. To embrace chaos in our consciousness journeys, therefore means to cooperate and flow with the transformative process, opening ourselves to our deepest emergent potential. It's O.K. to let go periodically and temporarily become unstructured nothingness and open to holistic re-patterning. Chaos is self-organizing, self-iterating, and self-generating. It is an evolutionary force. The tendency of new forms emerging from chaos is toward a higher degree of adaptation, hence evolution (Kauffmann, 1991). This "recycling" of consciousness leads to a self-referential vortex. Chaotic systems revolve around nexus points, known as strange attractors, because of their unpredictable quality. Rather than being "point-like," they are more like vortices within vortices. The Philosopher's Stone is like a psychic lodestone (or vortex). It acts like an inner magnet, ordering the contents of our consciousness around it (through feedback loops) in chaotic, yet meaningful fashion. The Philosopher's Stone may thus be seen as a "strange attractor" in the life of anyone engaged in the quest for transformation. It is an instinctual attraction toward processes which dissolve the ego and liquify consciousness, leading to transpersonal experience after symbolic death/rebirth. Freedom in the exploration of imagery comes from the creative capacity to experience loss. Experientially, it appears as being channeled into the swirling mass of interacting symbols, an overwhelming vortex of pure information. We are sucked inexorably into interaction with the self-symbol, sucked into ourselves, like flotsam is pulled into a whirlpool. This is the vortex of the system, the vortex of self, where all levels cross. It overwhelms or tangles the mental processes, the self-imaging processes that maintain the illusion of stable personality and individual boundaries. In solutio, the body is joined with the soul and spirit. The skin-boundary dissolves into visceral as well as spiritual perception. Awareness of physical processes may be greatly amplified, appearing as impressions, intuitions, sensations, sounds, odors. The body is always speaking silently. Through this raw, physical expression, that which was solid becomes liquified, dissolved, deliteralized. The concrete image of the body "morphs" into the flow of pure energy, in a variation of Transubstantiation. It is the "rapture" of being siezed up into the heavenly realm. The flow of dynamic energy from the deep Self reawakens and activates the body, and also that portion of the unconscious that the body carries. The body not only carries, but is the memory of the entire evolutionary cycle. Consciousness can access any portion of this material memory through creative regression. The body manifests kinesthetic, preverbal, and preconceptual memory of its direct experience. Immersion in the healing creative energy flow is like a spiritual baptism, which facilitates creative reformation of ordinary consciousness, and even the physical body. Solutio, as a state of consciousness, unites the powers of above and below, transpersonal and personal. It is the integration of the higher spiritual powers with personal experience that embodies the healing dynamic. This produces the paradoxical poison-panacea. The dual nature of the universal medicine points to a consciousness state beyond both opposites. In Greek myth, Athena gave Asklepios, the divine healer, the blood of Medusa as the universal medicine. In its negative aspect it was toxic and produced death. The positive aspect brought healing; this mysterious potion is the "cure-all," the "solution." Divine water (sometimes symbolized as blood) is dangerous, poisonous, seductive, addictive, even deadly in its primeval, untransformed state--madness. In the science fiction novel, DUNE, the new messiah and the Reverend Mothers of the Bene Gesserit sisterhood imbibe the psychoactive "water of life" with impunity. Moving past the fear and pain, they transcend time/space and commune with the continuum of all existence. What sets them apart from others, on whom the potion has a fatal effect, is their ability to withstand and convert its initial toxic effects into a religious ecstasy. They know how to navigate in that turbulent flow, during their consciousness journeys--"moving without travelling." The alchemical solution to this problem of primordial, raw experience is to "cook" it into a reflective consciousness. Recycling itself, the ego cooperates in its own "re-creational death," connecting with the transpersonal forces of rebirth and renewal. The reborn personality is resurrected, restored to life through new meaning. The ego acknowledges the Self as its new center of gravity, and personality heals. Experiential connection to the living reality of the Self, the "waters of life" is the panacea, the magical elixer of life. Solutio (and its prime agent, chaos) arises spontaneously from the depths as irrational images, dreams and fantasies. In dreamhealing, the dream symbols are followed deeper and deeper down to the primal level where all structure dissolves into its original source. This journey into the depths, and subsequent emergence, is the basis of shamanic healing. As we journey in the autonomous consciousness stream, guided movement deeper into and beyond the fear and pain brings up the classical imagery of the solutio, as resistance subsides. There is no part of it that is not us. The transformative process dissolves blockages, obstructions or "frozen" consciousness which disturb and distort the free flow of energy. The alchemist Paracelsus said, "He who enters the kingdom of God must first enter his mother and die." That death-like silence is also our mother, the virgin womb of the imagination. The dynamics of "creative regression" are common to mystical experience, psychedelic exploration, and therapeutic consciousness journeys. All lead to immersion in the flow of the stream of consciousness. Creative regression is a generic form of the myth of the eternal return, chronic recurrence, reiteration. In the dynamics of chaos theory we find this recursive motion in the concept of iteration--self-similarity--which produces the similarity in infinitely descending scales of fractal generation. Iteration is like a stretching and folding of the spacetime continuum. Experientially it manifests within us as a spiritualizing instinct, a recursive "bending back" of instinct toward that which is primordial and divine. Thus, whether induced through psychoactive substances, mystical transport, or experiential psychotherapy typical imagery recycles, recapitulates, or reiterates cascades of impressionistic transformations spanning the entire spectrum of archetypal experiences--morphological transformations. These include but are not limited to childhood, birth, embryonic development, ancestral, mythic, genetic, evolutionary, universal, and quantum consciousness. Access to the entire continuum of organic and inorganic evolution as well as the collective unconscious becomes available. That information most pertinent to the whole self emerges in the stream of consciousness as virtual experience. What is pertinent is what gets spontaneously "downloaded," and it repeats and reiterates the basic issues in yet another, eternally creative way. Stan Grof has catalogued an extensive taxonomy of these states, most notably in THE ADVENTURE OF SELF-DISCOVERY (1988). Such experiences of cosmic consciousness constitute a "return to the Mother," the blissful fusion of primal union, at both personal and universal levels. The direction of this dynamic process is recursive, bending back through deep time, ontology, and phylogeny. It echoes the semantic roots of the words religion and yoga, which imply a "linking backward" in the bond between gods and man, a craving for ecstasy, and transcendence of the limitations of physical form (Milkman, 1987). Jung called this dynamic an opus contra naturam, a work against nature. But chaos theory shows us it is actually quite organic, natural, and instinctual. In alchemy it was the Great Work. Consciousness turns back on itself, reiterating each level of organization, de-structuring each strata as it dives deeper toward the unconditioned, formless beginning, or "unborn" state. This primal state is amniotic bliss experienced as the Void, the cosmic womb. Images of the Great Mother system become reactivated, though not exactly in their original form. Imagery like fractals is self-similar, but not entirely identical. This creative regression is to the prepersonal domain, the preverbal, preconceptual domain, not the transpersonal spiritual domain (transverbal, transconceptual). Typically in the first few dreamhealing sessions, a person will enter a dream symbol doorway which leads back to a conception memory. They may or may not recognize it as such during the journey. But in content, the symbolism is very clear. The imagery is fundamental or primal, appearing as a dance of energy, matter, and consciousness--the body-ego's conscious experience. These images are close to the stuff of our creation -- the prima materia -- of our existence. We may experience it as free-floating: a paradox of chaos and a deep-felt sense of flowing and peace. The imagery here is psychedelic -- consciousness expanding -- an autonomous manifestation of imagination. The panoply of the ceaseless transformation of energy may overwhelm the senses, leading to a sense of total chaos. There is nothing to do but let go, surrender to it, merge with it, flow with it. The dancing energy waves and patterns are perceived as deep whorls, spinning spirals, black holes, infinite voids, gray clouds of nothingness. There is melding of the senses -- synesthesia -- such as "tasting" music, "seeing" sound, etc. Simple throbbing and other extremely primitive sensations may be experienced. Experience of this state produces a new acceptance of the original conditions of conception, and re-structuring of the primal self-image. We go into the primal chaos to begin the process of reformation from our pre-structural beginning. In essence, we re-enter the womb as we are initiated in the mysteries of the psyche. We re-conceive our primal self image, healed by communion with the creative Source. The classic text of re-creational surrender or sacrifice of self is THE BARDO THODOL, or THE TIBETAN BOOK OF THE DEAD. It is explicitly for the living who undertake the death-like regression into the unconscious, as well as the dying. Because of their orientation toward consciousness journeys, THE PSYCHEDELIC EXPERIENCE and THE AMERICAN BOOK OF THE DEAD are useful translations or contemporizations of the transformational classic. The realm of death is the twilight zone between consciousness and matter. Here psychoid phenomena manifest through the mingling of these modes. Here mind/matter duality ceases, creating enchantment, uncanny synchronicities, time warps, psychic experience, revelation of the mind of matter, the Nature Mind. The moment of ego death is heralded by certain symptoms of transition. Resistance by the mind to this creative dissolution brings about physical symptoms which range from shaking and a sense of increasing pressure and anxiety, to paradoxical flashes of hot and cold, to extreme dizzyness and disorientation. As the classic psychedelic manual says, "The hard, dry, brittle husks of your ego are washing out; Washing out to the endless sea of creation." (Leary et al, 1964). Distressing or disturbing symptoms symbolize the violence of the passage of consciousness from form to formlessness. Images of the body disintegrating or being blown to atoms (fear of exploding = fear of expanding) are characteristic psychedelic experiences. Perhaps the very elements of our bodies "remember" their formation in the crucible of some supernova. There may be identification with merciless destruction, the Dance of Shiva, the raging elements of nature, a variety of forms of explosive discharge. Here are visions of fires, floods, raging storms, earthquakes, volcanoes, turbulent lakes of magma. Consciousness "breaks up" into its elemental forms, manifesting as overwhelming imagery. This first phase of dissolution may be characterized by the futility of resistance, magnetic downward spirals, gravity wells, loss of morphological identity. E.J. Gold describes the second stage of the voyage as one of being overwhelmed by illusions produced by conditioning. Yet the primal element of pure forms breaks through and the voyager recognizes "the basic component of consciousness which when combined produces what is called the element Water." In consciousness journeys, chaos functions as the universal solvent, that which dissolves all patterns and forms including the rigid, outmoded aspects of the self. In the dream journey, one might enter a spinning vortex and become dismembered by centrifugal force, torn limb from limb. We remain in this state of dis-integration until we re-member our essential self, embodying the wounded healer. That sense of disintegration comes as the ego gives up its "unified" linear perspective (bivalent) to the multiple consciousness or awareness (multi-valence) of the deep self. Fear makes it feel like fragmentation, but in truth there is nothing in that imagery that is not us. The death throes of the ego prepare it for rebirth, through communion with cosmic consciousness, a new incarnation of the spirit, death and resurrection. The nature of universal consciousness is oceanic. When the ego is in danger of "getting in over its head," it panics as if faced with drowning in the depths of this vast ocean of consciousness. It overwhelms the ego which cannot fathom this abyss. This aspect of solutio brings mythic images of the dying god, of violent death and sacrifice, and of the isolation of the hero. It means nothing less than the sacrifice of the old self. The dissolution phase may mean myths of the triumph of darkness; myths of floods and the return of chaos, of the defeat of the hero. In Gold's words, "Death comes to all forms; everything eventually is broken up by dissolution, so there's no point clinging to yet another biological form out of desire, longing for stability, or from fear and weakness." The ego "takes the plunge," it lets go and dissolves its old matrix, its old boundaries. When its boundaries melt, ego-consciousness dissolves into deep consciousness. The "wave merges with the ocean," and experiences its own deep transpersonal nature. It moves swiftly through the fear and pain, awakening to an infinitely wider reality of universal energy waves. In the ocean of creativity, "your own consciousness, shining, void and inseparable from the great body of radiance, has no birth, nor death." (Leary, 1964). Experience of the pure, unmodified state of consciousness transcends all opposites, and therefore consciousness journeys provide an experiential "container" for the reconciliation of paradox within a larger field of experience--a broader, transcendent perspective. The transformational process acts as a "container" (alchemical retort) of the contents of psyche. But these contents, reduced to their essence are "nothingness," simply dreams and imagination. Emptiness is the real Philosopher's Stone. By dissolving into non-relative consciousness, mood swings or identification with conflicting polar positions may be transcended by an enlarged state of consciousness which embraces and contains the entire continuum. Flow replaces polarity. Jung spoke of the transcendent function as a symbol-forming force continuously creating emergent imagery which facilitates whole-self realization. It is thus an evolutionary and adaptive force. Mindell (1985) speaks of the flow in alchemical terms: The alchemists called this flow the 'aqua permanens', or permanent water. Aqua permanens is the fluid process, the energy or life which was locked up in the tension of conflict which has now been freed through the flow between the opposites. Fluidity comes from conflict. Whereas before there was a boundary between conflicting opposites, between intent and reality, streaming energy now transforms therapy into natural science. Dreams, visions, or the stream of consciousness can be used therapeutically as an evolutionary force to guide people from a small sense of self and expand them toward a larger image. This expansion of the sense of self may require some adjustment. The illumination (awakening to larger Reality) may also come through a nature-mystic experience, intense sexual experience, E.S.P., a consciousness journey, or meditation. Enlightenment (even the "seed" of enlightenment) is an experience of awe, bliss, and infinite possibilities. The ego realizes it is not the center of the whole person, but only "manages" the personality. There are autonomous archetypal forces which inhabit the psyche with their own agendas, patterns, and goals. Our psyche is transpersonal; it has no boundaries. Our conscious awareness is only a manifestation of this larger consciousness. Within this larger consciousness, we are at home with a plurality of visions. The parts contain the whole (to a degree), enfolded or embedded like a fractal or hologram. Containment may take place symbolically in the therapeutic relationship. The consciousness guide, therapist, or shaman functions as a guide to the netherworld. The "wounded healer" has a numinous quality which provokes the projections of others. Shamans work within the belief systems of their subjects to expand their sense of what is possible. Those subjects' experiences generally reflect the style and beliefs of the shaman--the shaman's positive expectation of particularized results. Exposure to the infinitely broader worldview of a shamanic personality will automatically move a "smaller" personality into solutio, dissolution. This rapport or participation mystique is an unconscious, automatic process--a positive sort of psychic contagion. This unconscious dynamic may be responsible for the phenomenon of "contact high." Psychedelic, as well as mystical literature contains many examples of surrendering, letting go, accepting, merging, and joining the flow of the "Nature Mind," where all is consciousness--the audible life stream. This "Diamond Consciousness" is awareness of creative flux of the Void, the fluid unity of life. We flow within it, and it flows through us. The death-rebirth sequence typically opens a person to the transpersonal domain with its virtually infinite creativity. It reveals and unfolds our future potentials. In dreamhealing, chaotic consciousness is also creative consciousness. Terence McKenna reminds us that, "Riverine metaphors are endlessly applicable. They represent the flowing of forces over landscapes, the pressure of chaos on the imagination to create creatively. . .The key is surrender and dissolution of boundaries, dissolution of the ego." When we immerse ourselves in that creative energy, we find healing on many levels of our being. It may feel tingly or effervescent, or like streaming energy. Direct experience of this level brings a true sense of oneness with all that exists, the seamless fabric of existence. It opens us to re-patterning by the whole--a re-construction or re-patterning of personality through holistic change at the most fundamental level. Immersion in the oceanic experience of universal consciousness is a life-changing experience. It is experience of the web of life, the biological life flow, an ineffable current of bliss. Once we experience that larger world and self--the rhythmic pulse of all life--we are never the same again, so long as we remember. Communing with this energy, experiencing these states of consciousness, has been the practice of shamans since the dawn of man. Shamanic consciousness means the ability to enter and exit altered states at will. This power is connected to the liquid expression of life--the sap of life--the vegetable forms of the liquid Stone, and its identity with psychotropic plants. This notion reiterates that of the "greening of consciousness." Franklin Merrell-Wolff (1973) spoke of the distillate of his mystical experience as follows: "The Current is clearly a subtle, fluid-like substance which brings the sense of well-being already described. Along with It, a more than earthly Joy suffuses the whole nature. To myself, I called It a Nectar. Now, I recognize It under several names. It is also the 'Soma,' the 'Ambrosia of the Gods,' the 'Elixir of Life,' the 'Water of Life' of Jesus, and the 'Baptism of the Spirit' of St. Paul. It is more than related to Immortality; in fact, It is Identical with Immortality." When the ego is completely dissolved in this renewing bath, we experience timeless consciousness, and are reborn based on a new, healthier primal self-image. This rejuvenation comes from connecting with pristine consciousness, the eternal aspects or forces of nature. Even though we cannot conceive of it, we can experience the infinite, the eternal, the transcendent. Visions of Creation, Emanation, the upwelling Source, emerge. 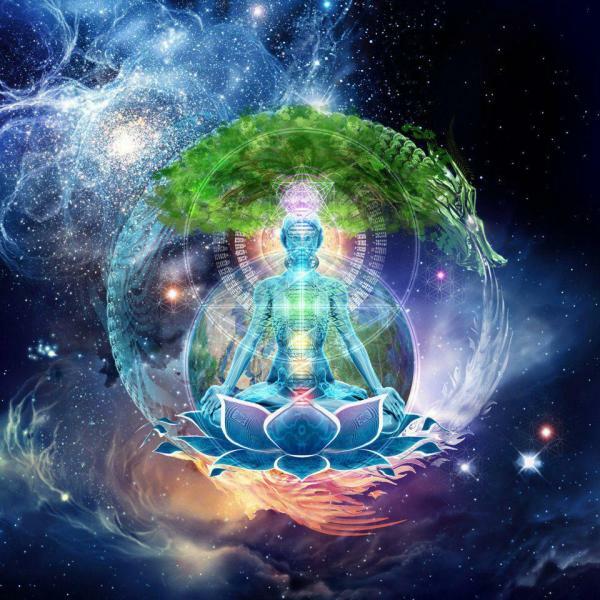 Spiritual reincarnation means bringing to life that which was formerly dead or unawakened, through connection with the original creative power. It is the theme of the Quest -- the greening of the Wasteland. The process of rebirth is the mythic enactment of "the one story" whose pattern is found in every narrative. Beneath the differences, the meaning -- having to do with the loss and recovery of identity -- does not change. This story of the loss and regaining of identity is the framework of most literature, from which comes the hero with a thousand faces. Some variation of the hero's adventures, death, disappearance, and marriage or resurrection are the focal points of most stories. The original sense of identity (romance and comedy), its loss (tragedy and irony), and its recovery in the regenerate world of romance and comedy is mirrored in the mythic quest. Myths of the birth of the hero, revival and resurrection, creation and defeat of the powers of darkness and death are perennial themes. The descent and subsequent ascent, going deep into the consciousness journey and emerging transformed, is a form of death/rebirth, a powerful archetypal theme which is initiatory in character. Aesculapian dreamhealing, uses many ritual forms of purification, such as diet, sweats, and baths. But the psychic purification is a process of shedding fears and pain which prevent us from flowing. Fear and pain are what keep us "stuck." Each initiation contains an ordeal within its enfolded nature. At least it feels like an ordeal to the old ego structure which must dissolve or die. The quantum leap of initiation, being seized from one state and moved to another, involves a sudden and profound change. It requires an adjustment. Also, life may present synchronistic challenges, outside the dreamhealing sessions. One dreamhealing participant was having a sweat. She was sent to look for an offering in the form of some wood to burn in the ritual. She finally returned with a huge gnarled log, which was quite representative of her twisted back (scoliosis). That wood really stank when it first was consigned to the fire--but as time went on, it burned pure and smelled extraordinarily sweet. She emerged with more mobility than she could remember every having and the healing persists. In yoga, we hear about clearing blocks at the various chakras through purification practices. Progressive stages of purification allow the energy of the serpent power to flow or rise ever-higher through the chakra system. Thus, the yogi realizes the true nature of self. Mindell (1982) has commented on this process in regards to flow and healing: In healing ceremonies, light, water, love, release of emotions, energy flow, circulation, harmony and crystal clear water are all descriptions of curative experiences. The water is a description of free flowing energy which cleans the body by unlocking egotism and its resulting cramps. . .The sap of plants flows in the body of the enlightened yogi. In India lack of flow in the imaginary veins and arteries which carry energy and blood is blamed for illness. Cleaning these conduits and reestablishing flow is all-important. . .there is a resistance at some point to the flow of energies. In fact, all disease is merely a restriction of the flow of life force in a particular area. Speaking more of the mental aspect of the process he uses water as an image of purification ordeal: Whenever a complex exists, consciousness rigidifies and tries to steer around the strong emotions connected with the core of the complex. Water therapy allows the complexes to speak, encourages the body to dance its own rhythm and lets the unpredictable come alive. A water experience is holistic and unifies the entire personality so that ego, Self, dreams, body, inner and outer come together in one human being. The more rigid the ego and the more powerful a governing complex, the more threatening the flow of the body or the psyche appears. A rigid and frightened personality becomes terrified, split off from nature, and cannot believe that a Self or a body consciousness exists that can organize behavior once ego rulership is given up. . .Water is medicine against the rigidification of intuition, physical mobility, and feelings. Another expression of purification ordeal occurs with psychedelics. It is a mental purge of gross karma which manifests as wrathful visions or second bardo nightmares. These visions, as well as the peaceful ones must simply be endured, despite awe and terror. They may be horrific visions of apocalypse and catastrophe--bloodthirsty hallucinations. They come as the ego struggles to maintain its boundaries, as the mind seeks to reconstruct the personality. But the experience of this hellish state of consciousness is not mandatory with every journey. Recognition of the greater Reality brings instantaneous liberation from this ordeal. Edinger (1973) uses Job from THE BIBLE as a classic example of an ego's confrontation with the awesome powers of the unconscious through its trials and travails. Job's encounter with the Self brings about a death/rebirth experience. Job feels like he is being punished, and insists on discovering the meaning of his experience. Job encounters Jahweh in dreams first, anticipating later conscious encounter. Job is shown the abysmal aspect of God and the depths of his own psyche with its monstrous aspects, much like the wrathful visions of THE BARDO THODOL. Finally, Job's questions are answered, not rationally, but through living experience, conscious realization of the autonomous archetypal psyche. The realization comes to birth only through the ordeal. All these struggles in the cycling of death/rebirth may be linked back through symbolic similarity to the individual birth ordeal. It is characteristic of chaotic systems that events originally separated by time and space can become enfolded closely together. Events linked by the same state of consciousness are related; learning is state-related (Tart; Rossi). Our lessons and our ordeals are related to our states of consciousness. Thus personal and transpersonal experience of this eternal cycle of the generation of forms become fused and conditioned by the individual aspect of archetypal experience. There is more than a linguistic link between the metaphor of a liquid solution, and the solution of a problem. The moment of "a-ha" comes frequently in process-oriented therapy, as direct realization brings fresh understanding through the "empty mind," or "beginner's mind." Solutions come through creativity. They may appear effortlessly. The relationship between healing and creativity is implicit--healing is the physical analog of creativity, like attitude changes and intuition are its emotional and mental analogs. Healing is a special case of creativity, or creative problem-solving. During reverie states, the mind goes into chaotic patterns for problem-solving. The more difficult the problem, the more chaos. Dreamhealing facilitates entry into these healing states of consciousness. McAuliffe (198 ) reported in OMNI on the work of Paul Rapp detecting chaos in brain wave fluctuations: After analyzing the EEGs of humans, Rapp has also come around to this friendlier view. "When we are healthy and alert, the interval between electrical waves is never rigidly fixed," he reports, "but always vacillates around a certain frequency range." Moreover, when we are mentally challenged, the interval between the electrical wave becomes even more variable--or chaotic. This suggests, in Rapp's opinion, that chaos "may actually be highly beneficial during problem solving. Clearly the greater the mental challenge, the more chaotic the activity of the subject's brain. . .What does all this mean? In Rapp's opinion, chaotic activity may be an asset in problem solving. "You want to be able to scan as wide a range of solutions as possible and avoid locking on to a suboptimal solution early on," he explains. "One way to do that is to have a certain amount of disorderliness, or turbulence, in your search." We can draw a direct analogy between the dreamhealing process and creative process. Dreamhealing begins with the pilgrimage, which expresses one's intent or commitment. The creative process begins with receptivity, which includes interest, preparation, and immersion in the subject matter. Next in dreamhealing comes the confession, or the identification of the problem, where you have missed the mark. Creativity also requires the ability to identify the problem, see the right questions, to use errors, to have detached devotion. The purification or cleansing of dreamhealing parallels the generalized sensitivity to problems that come during creativity, an attunement to the realization of what needs to be done. The offering is a sign of letting go, sacrifice of the old ego form, the commitment to healing. Creativity requires the surrender of time and self to the process of flow; fluency of thinking; flexibility; abandoning old ways of thought. The heart of the quest is dream incubation, a reverie which seeks connection with higher power. Creativity also requires incubation, reverie, serendipity, spontaneity, adaptation, tolerance for ambiguity, and originality. This permits uncommon responses and unconventional associations. Healing occurs in a moment of oneness, chaotic consciousness. In creativity it is paralleled by the moment of illumination, redefinition, invention, vision. Dreamhealing requires amplification, or work on dreams and validation. Elaboration is its counterpart, the use of two or more abilities for the construction of a more complex object or theory, plus verification. Re-entry implies actualization, renewal, grounding, maturing. Creatively it means real-time application, follow-through, product, utilization of the result. It implies choosing the post-session personality, as re-calibrated through the imprint of the whole. It means stabilizing that state of creative consciousness which emerged in the session. In all cases, guided or not, the creative or healing process follows approximately this model. The resources are contacted deep within and they well-up in sometimes unexpected ways from the deep Source. Melting turns what was solid into a liquid. Variations on the theme include moistening and softening. Whether we look at modern consciousness journeys, ancient reports, or psychedelic experiences the metaphors are the same. Melting or softening is the result of incubation in dreamhealing, yoga, and alchemy. Who creates, and has created all things. And he be reborn as he was at first. Telling the Father to lie down and go to sleep. It was fruitful silver indeed. The Father's Body is moistened and softened. We may obtain Thy gracious Gift! While oil and True Tincture from him flows. The feverish father sweats the tincture of the wise from his body. The hidden fire causing the sweat is the antithesis of the moisture that it produces. This heat is the warmth of incubation, which is equivalent to a "brooding" state of meditation. The aim of this meditation is self-incubation for transformation and resurrection. This liquefaction is a characteristic state of consciousness during psychedelic sessions. When the normal structures of awareness break down, consciousness transforms to a flowing or fluid state. Speaking of his fusion of non-linear dynamics, post-structuralism, and psychedelic experience, psychonaut Manuel DeLanda was interviewed by MONDO 2000 (Issue 8; Winter, 1992). He reports on his experience in the language of chaos theory. The metaphor they use is solid, liquid, gas. If the system is solid, too crystallized, its dynamics are completely uninteresting. If it's gaseous, it's also uninteresting--all you have to do is take averages of behavior and you know what's going on. Liquids have a lot more potential, with all kinds of attractors and bifurcations. Now what they're coming to believe is that the liquid state in nature--not just actual liquids, but liquidity in the abstract sense of being not too rigid or too loose--these liquid systems "poised on the edge of chaos" are natural computers. ...When you trip, you liquify structures in your brain, linguistic structures, intentional structures. They acquire a less viscous consistency, and your brain becomes a super-computer. You are able to think concepts you were not able to think before. Information rushes in your brain, which makes you feel like you're having a revelation. But of course no one is revealing anything to you. It's just self-organizing. It's happening by itself. ...free-flowing matter and energy are capable of self-organization. I don't think there are higher states of consciousness. You liquify yourself, and you go through phase transitions, and then it seems to you that you are in a higher state of consciousness. When I'm tripping, I'm thinking concepts I'm sure no one's ever thought before, and in a way it's like a higher state of consciousness, but it's not a plane that was waiting there for me to access it. It's something I'm building that moment by destratifying my brain. There might be an ethics here: how to live your life poised at the edge of chaos, how to allow self-organizing processes to take place in all the strata that bind you. In your life, you could create maps of attractors that bind your local destiny--those behaviors that are habitual and so on. And try to find those bifurcations that would allow you to jump, if not to complete freedom--that doesn't exist--but to another set of attractors less confining, less binding, less stratifying. Or learn to lead your life near a bifurcation without ever crossing it--the lesson of being poised on the edge of chaos. In reducing all to pure water, the prima materia and the ultima materia become synonymous. That primal consciousness state, that creative and chaotic consciousness is the beginning of the operation of "water", and its ultimate realization. It becomes easy to see why the operation of water is the "root of alchemy." Through consciousness journeys which liquify our rigid notions of self and world, we re-create the adventures of the hero or heroine. The theme is the loss and recovery of identity. The hero is deserted, betrayed or even killed, but then comes back to life again. They may be swallowed by a huge sea monster, or wander in a strange dark underworld and then fight their way out again. The shift is from abandonment and isolation, to struggle, to the triumph or marriage phase, (unitive consciousness). The myth of the defeated hero (rigid ego) brings images of the triumph of dark forces, myths of floods and the return of chaos. Then the stage is set for miraculous rebirth--The Son is born from the Father, as in THE BOOK OF LAMBSPRING passage. This process of rebirth is the universal medicine. Abraham, Ralph; McKenna, Terence; Sheldrake, Rupert; TRIALOGUES AT THE EDGE OF THE WEST; Bear and Co., Santa Fe, 1992. Davis, Erik, "DeLanda Destratified"; MONDO 2000, #8, Winter 1992, p. 45-48. Edinger, Edward F.; ANATOMY OF THE PSYCHE, Open Court; LaSalle, Illinois, 1985. Edinger, Edward F.; EGO AND ARCHETYPE, Penguin Books Inc., Baltimore, 1973. Grinnell, Robert; ALCHEMY IN A MODERN WOMAN, Spring Publications, New York, 1973. Grof, Stanislav; THE ADVENTURE OF SELF-DISCOVERY; SUNY Press, Albany, 1988. Hillman, James; ANIMA; Spring Publications, Dallas, 1985. Kauffman, Stuart A., "Antichaos and Adaptation"; SciAmer, August 1991, p.78-84. Merrell-Wolff, Franklin; PATHWAYS THROUGH TO SPACE; Warner Books, New York, 1973. Milkman, Harvey & Sunderwirth, Stanley; CRAVING FOR ECSTASY; D.C. Heath & Co., Lexington, Massachusetts, 1987. Miller, I. & Miller, R.A.; THE MODERN ALCHEMIST (formerly The Book of Lambspring); Phanes Press, Chicago; in press (available Spring 1994). Mindell, Arnold; DREAMBODY; Sigo Press, Boston, 1982. Mindell, Arnold; RIVER'S WAY; Routledge & Kegan Paul, 1985. Rossi, Ernest: THE PSYCHOBIOLOGY OF MIND-BODY HEALING, W.W. Norton & Co., Inc., New York, 1986. Tart, Charles; STATES OF CONSCIOUSNESS; E.P. Dutton & Co., Inc., New York, 1975. Washburn, Michael; THE EGO AND THE DYNAMIC GROUND; SUNY Press, New York, 1988. Copyright © 2010-2014 Iona Miller, All Rights Reserved.